Combining RSS feeds is sometimes useful for managing RSS Feeds. Yahoo Pipes is a great tool for merging RSS feeds, and doing mashups with a bunch of RSS feeds. If you are not comfortable with Yahoo Pipes check out FeedMingle, it is the easiest way to merge RSS feeds in to one. 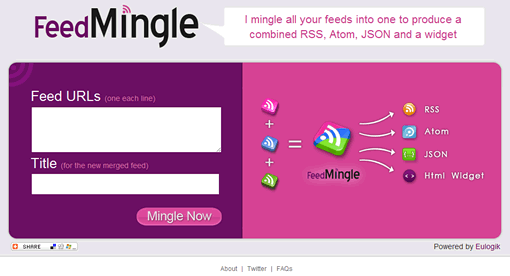 FeedMingle takes multiple feeds and combines into one, the output is generated in RSS, Atom, JSON and a as html widget. The RSS Feed works fine in Google Reader but a major drawback is that it won’t tell you the source of the feed. If you merge several feeds this is going to be a mess. Another thing is that it won’t allow you to see full RSS feed, it truncates the feed automatically even the original feed you merged is full. If you need to a quick solution to merge feeds use feedmingle, otherwise there is always Yahoo Pipes which is far better and offers lot of control. You should note that FeedMingle will add an additional RSS into your mix, which contains their advertisements. No way to get rid of it that I see. ugh.